The writers and historians here at Findmypast are always coming across fascinating stories and historical treasures - which are too good not to share. In our regular column, Jim's Gems, we look at the curious discoveries of Findmypast writer Jim Shaughnessy. 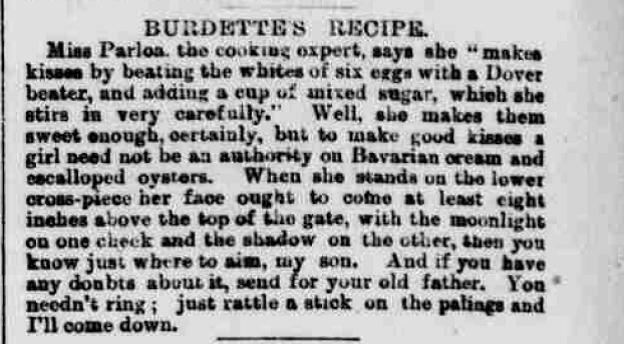 This week: the awful recipes our ancestors seemingly lapped up eagerly. It’s no secret to anyone that our eating habits in the UK have change over the past couple of centuries. Where once we had adulterated bread and endless mutton, now we have pasta, hot dogs and Heston at Waitrose. But just how much has it changed? I’ve had a look at the British Newspaper Archive to see what recipes the newspapers were printing before any of us were born. It’s 1915. Things are pretty bleak at home and abroad as war wages on over the Channel. It’s up to the newspapers to create an air of optimism and aspiration, make promises of a brighter future that we can all enjoy. The Evening Dispatch went its own way, however, offering us this…creation. 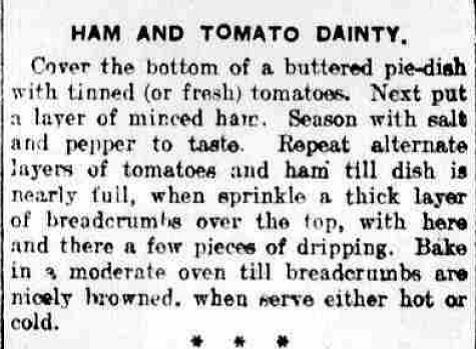 Layers of sliced tomato and minced ham bunged in an oven and served with a frown. There are many, many questions raised by this recipe. Would a soup consisting of kidney, gherkins, lemon juice and egg yolks really be that much worse if the kidneys were slightly overdone? Was 1877 the year that the Dundee Telegraph just gave up? Whatever the answers are to these and the millions of other questions raised by this recipe, I hope to never be on the same continent as this particular avenue of gastronomy. This is it. They’ve done it. This is the pinnacle of British cuisine. Why did we not stop here? 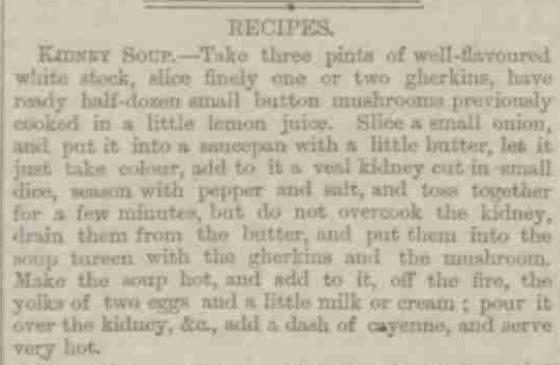 Why are we messing around with sorrel and shiitake mushrooms when in 1910 it was cracked in the Sheffield Evening Telegraph? They don’t even need to explain any further than in this image. Is your meat boring? Drink beer. 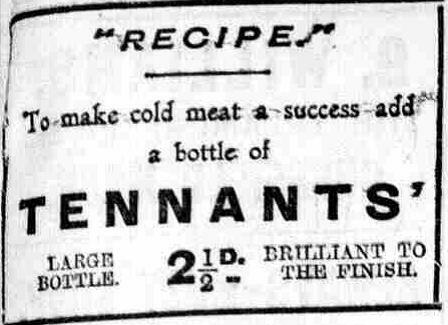 That’s a recipe I’d like to see on Masterchef: The Professionals. Not sure this is a recipe really. Makes me a bit queasy. 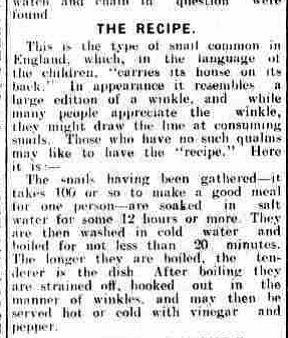 Put 100 snails in salt water, boil them 12 hours later, then eat them with vinegar. You’ll note that it takes ‘100 or so to make a good meal for one person’. 100 snails. From the garden. Can you possibly imagine how long it would take to cater a medium sized dinner party? The writer of this piece is probably still looking.